Matthew McConaughey and his his family spent the day walking along the shoreline of the Hudson River in New York City on Sunday. Pregnant wife Camila Alves wore a flattering blue dress while she held hands with two-year-old Vida and three-year-old Levi. 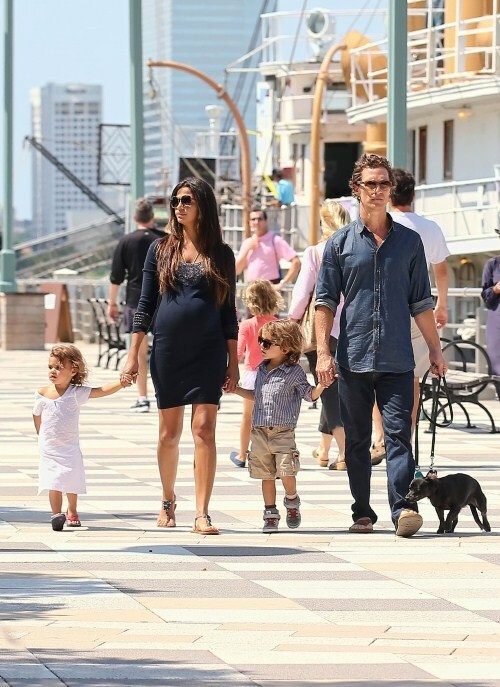 McConaughey wore a jean shirt with jeans while holding Levi’s hand as he walked their family dog. McConaughey is in the process of dropping 30lbs for his new film, The Dallas Buyer’s Club. In the film which begins filming in mid-September, McConaughey plays real-life AIDS victim Ron Woodroof alongside two-time Oscar winner Hilary Swank.